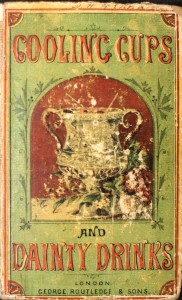 Written by William Terrington, in 1869, Cooling Cups and Dainty Drinks is the earliest British publication to document cocktail recipes along with classic British and European mixed drinks. This is the 1872 edition. In addition to a Gin Cocktail made with ginger liqueur (the Gin Cocktail cocktail referred to in a 1798 British Newspaper that was “vulgarly called ginger”), there are a couple of drink recipes that were formulated by Britain’s first celebrity chef Alexis Benoit Soyer back in the 1850s, which were also featured in Jerry Thomas’s 1862 Bar-Tender’s Guide.